June 24, 2004 was likely one of the happiest days in the life of Shaun Livingston. On that night, he was the 4th overall pick, and the first PG selected in the NBA draft. The 6’7” pass first, shoot second true point guard with the 7′ wingspan had some comparing him with Magic Johnson. In 2007, during arguably his best season, Livingston suffered a terrible knee dislocation that sidetracked a potentially very promising career. Three years and three teams later, Livingston is on the second 10-day contract with the Washington Wizards. Once it became clear that Mike James was not going to remain with the team, it became clear that the Wizards would need to pick up another point guard. The Wizards were fortunate enough to pick up Livingston, who had played earlier in the season with Oklahoma City. Livingston gives this current roster its second true point guard – the other being Earl Boykins. While Boykins seems to be best suited providing energy off the bench. He does tend to be a shoot first, pass second point guard. In addition to Livingston’s passing ability, his height is also an asset. He is able to post up and comfortably shoot over smaller guards. When he has gotten a chance to play he has played well. His unique combination of skills has defenses fits as he has gotten into the lane creating easier scoring opportunities for his teammates. The Wizards have 20 games remaining in this season, they should have seen enough from Livingston to know that warrants a longer look – picking him up for the remainder of the season. While Flip Saunders wants to win as many games as he can, it is also important to develop his young players in the process. Shaun Livingston should be an important component in the team’s short and long-term development. While it has been three years since his injury, Shaun Livingston is still recovering. He has played in less than 40 NBA games since his rehabilitation. If Livingston can continue to work himself back into peak condition the Wizards may have gotten very lucky. It is very likely that Livingston will never fully attain what was his full potential. However, at 24 years of age he is still a young guy with upside potential. The fact is that he can be very effective even if he does not get fully back to where he seemed to be going as a player. He has demonstrated with limited minutes that he can still create plays for his teammates. And at this stage in the season, it is much more important to allow him to work himself into shape – while on the floor. It does not help this team’s development by playing Earl Boykins for extended minutes. Flip Saunders and Ernie Grunfeld both know what Boykins can provide the team and more to the point he is not a part of the long-term future of this team. They should give Livingston as much time as his body can handle. If he continues to improve, the Wizards have potentially found a guy, in Livingston, who can be their second string point guard. If they are really lucky, he could develop into a guy who can play in the back-court with Gilbert Arenas. It is important though that the Wizards let that process begin now. The first step in that process is picking up Livingston’s contract for the remainder of the year and then giving him an extended look on the court. I will admit that given all this kid has gone through in his young career, I would like to see his career get back on track. I would like nothing better than for this kid to develop into an all-star caliber player. And if Livingston is on the verge of getting some semblance of his career back on track, I hope the Wizards are smart enough to spot that now and take a chance – an inexpensive chance at that – on a guy who had NBA draft lottery talent. At the very least, he appears to be the best point guard they currently have on their roster. Earlier today I came across John Schumann’s article on NBA.com titled, “Jamison fitting in quite nicely with Cavaliers.” The article largely focuses on Antawn’s overall adjustment to playing with the Cavs. Reading the article there were a few comments that I felt did not tell the full story. I have pulled a few of those comments out and added my own responses. It is true that Jamison has not previously been a part of a team that can be considered a good defensive team, so it is likely to believe that over his 11 year career, he has likely picked up some poor defensive habits. Schumann also points out that this mini-resurgence in Cavs defensive prowess has come during a stretch when they weren’t playing the most talented teams. This statement is likely true of any solid (or better) NBA vet and does not uniquely apply to Jamison. If you surround that player with teammates who are willing to play defense, a coaching staff that teaches defense, and more importantly requires you to play defense, then one would not be surprised that the team generally plays good sound defense. While there will be peaks and valleys in the team’s defensive performance throughout the year, in general it would be a safe bet that that team will be regarded as a solid defensive team. Jamison is likely comforted by the fact that he has good solid defensive teammates that know what their role is and who is supposed to help on any given offensive set. However, trust cuts both ways. 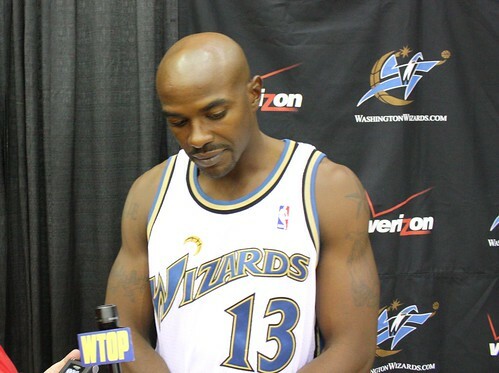 During his time with the Wizards, Jamison has not always rolled to help out on plays when it appeared that he should. So would it not be likely that one of his teammates develop a lack of trust with his defensive effort? One good place to see this demonstrated is on Kyle Weidie’s Truth About It.net. Following a number of games – for example this one versus the Knicks – he went out of his way to demonstrate through screen shots the inability of the Wizards (including Jamison) to play good sound defense. While Jamison clearly has benefited by being part of a better defensive team and he is smart enough to know he has to pick up his defensive effort, it should not be made to seem as if he did not have a role in his previous teams generally poor defensive efforts. It will be interesting, however, to “witness” how far Jamison’s defensive skills have improved once the playoffs begin. When the games truly count, teams will begin to game plan to take advantage of the Cavs weaknesses. And until Jamison proves otherwise, he has to be considered a weak link in Cleveland’s defense. I caught the Mike James interview on 106.7 The Fan’s The LaVar Arrington Show with Chad Dukes. During the conversation, I couldn’t help but wonder what issue (if any) did Flip Saunders have with Mike James? I’ve heard and/or read people who have spent time with Mike James mention that he is a honest and straight forward individual and I have no reason to believe anything else. So in this scenario, I am going to take his comments on face value. On a few occasions this season he has pointed out that he worked extremely hard in preparation for the season and could not figure out why he wasn’t playing. He reiterated those thoughts during the interview. James seemed to indicate that Flip Saunders, or someone on his staff, had a preconceived notion of him as a player and he was not afforded the opportunity to disprove those notions. Any time that there is a coaching change, it is likely that a coach has inherited a player (or players) that does not fit his/her style of play. Depending on the contract situation, that player (or players) is usually traded or released as quickly as possible. It is a possibility that this situation with James was as simple as that. Maybe Flip, who is notoriously demanding of his point guards, did not feel that James’ style of play over his career fit the way he wanted his point guard to play. And maybe he thought that Mike James was too set in his ways to adapt to his system of play (old dog, new tricks cliché). If James did not fit, then it would seem to have made more sense for Ernie Grunfeld to trade James during the off-season, or at least much earlier in the season – ideally prior to his hand injury. But after he returned from his injury, and it was apparent that he was going to be with the team for a while, it makes you scratch your head that he couldn’t manage to play for a few minutes per game. Particularly during games where he might have provided a better match-up off the bench then Boykins. For those of us who aren’t in the Wizards locker room and practices, it would appear that James’ inability to get off the bench would seem to indicate that there was some larger issue just beyond what we can see. While Mike James’ days with the Wizards are over, I would love to know why Flip Saunders felt that his team was better with James on the bench than with him getting at least a few minutes per game.